For many people, looking great is a simple matter of a skin rejuvenation treatment for pigment and vessel clearance to reveal clearer, more attractive skin. Palomar has a treatment for pigment and vessel clearance that's fast, easy and well-tolerated. 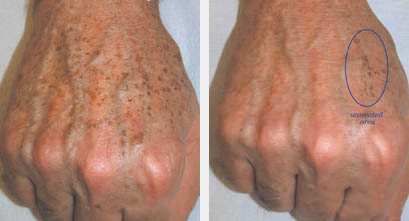 Palomar puts the power of pulsed light and lasers in your hands to strategically clear vascular and pigmented lesions. The secret of our pulsed light's performance lies in our dual filter technology that delivers optimally filtered wavelengths of pulsed light, for results as good as or better than those of competitive single-application lasers. You'll save time with one system for a wide range of treatment procedures, including vein removal, rosacea, telangiectasias, hemangiomas, sun damage, dyschromia, melasma, poikiloderma, and angiomas on the face and other body areas. Your clients will enjoy more comfortable procedures with excellent outcomes and less downtime. And, you'll both agree that Palomar simplifies skin rejuvenation treatments for the better. Palomar® offers skin care lasers and pulsed light devices that deliver energy to target and destroy vascular and pigmented lesions associated with spider veins, reticular veins, rosacea, telangiectasias, hemangiomas, sun damage, age spots, dyschromia, melasma, poikiloderma, and angiomas from hands, legs, chest, arms and face. Using the principle of selective photothermolysis, these treatments target different chromophores in the skin, which selectively absorb the laser or light energy as heat and yield the desired response. These optimal wavelengths of light clear vascular and pigmented lesions by targeting the chromophores of hemoglobin (for vascular lesions) and melanin (for pigmented lesions). 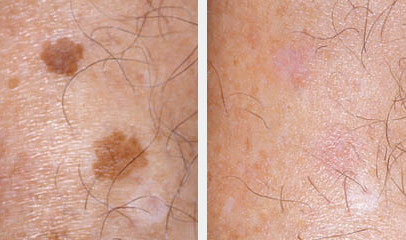 These damaged lesions are then cleared by the body, removing the appearance of the lesion from the skin. Pigmented lesions undergo a mild desquamation and slough off within two or three days, while the vascular lesions blanch and then resolve within 10 to 14 days.